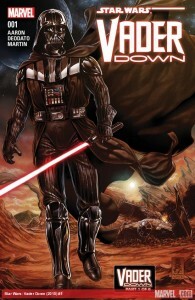 The Pullbox Reviews Vader Down #1- It’s just one guy… how tough could he be? So I’ve been reading Marvel’s multiple books set in the Star Wars galaxy, at multiple points in the timeline. The main parts of the story is taking place in the Star Wars and Darth Vader books, taking place immediately after the Battle of Yavin and the destruction of the first Death Star. It took a little getting used to, because I’ve read most of the “Expanded Universe” stories, which have now been wiped from the history books. The comics make quick use of that, diverging from what longtime Star Wars fans thought they knew about the galaxy far, far away. In the end, it’s been a very good thing. And then I heard about the upcoming crossover event, “Vader Down”, coming out just in time for the holidays! Beginning in “Vader Down #1”, the event starts with the Sith Lord on his way to the remote planet of Vrogas Vas, the site of a long abandoned Jedi temple. Vader has learned that Luke Skywalker, that punk kid who blew up the Death Star and turns out to be his long-thought-dead son, is there and Darth is determined to capture and turn Luke to the Dark Side. What Vader did not know was that Vrogas Vas is currently home to a company of Rebel troops, manning a fueling station on the planet’s surface. In an example of crazy random happenstance, Luke is there… with three squadrons of X-Wing fighters, including Red Squadron, on a series of training exercises. As can be expected, violence then ensues, and Vader begins the task of wiping out the competition. Luke soon realizes who it is they’re up against, and in a desperation move to save as many of his fellow Rebel pilots as he can, he rams Vader’s TIE fighter with his own X-Wing. Both ships crash on the planet’s surface. The Rebel Alliance sees the opportunity they have, as Princess Leia puts it, “to take away another of the Emperor’s favorite toys.” All troops in the area are scrambled to get to Vrogas Vas as fast as they can. Vader is alone, stranded on the planet without comms, and he needs to be taken out at all costs. To that end, a battalion is on the way to support the forces already on the scene and on the hunt.